A South Carolina I-95 Bed and Breakfast located in Florence South Carolina. 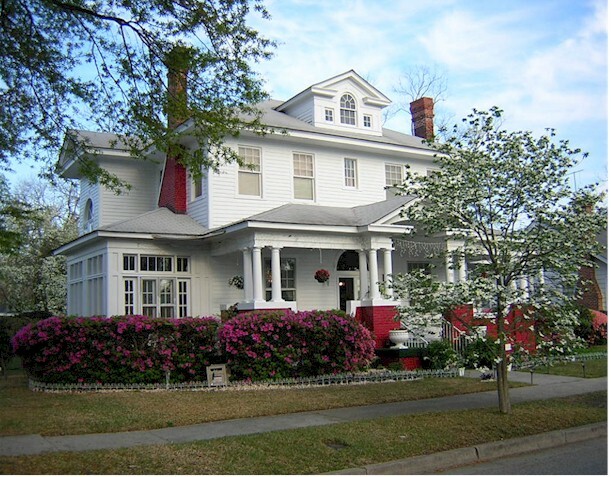 This Florence SC Bed and Breakfast offers east coast charm and southern hospitality to all those who visit. Email Us Ambrias Garden Manor was built in 1920. It is known locally as the Old Holman's House. The home was build by Francis P. Holman and was occupied by his family for the last eighty three years until purchased and re-decorated by Bed and Breakfast owners David and Ella Frazier. This old Victorian Manor House has much to offer its guests. Amenities include space and relaxing common areas including a media area. 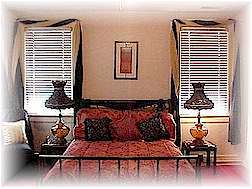 This historic South Carolina Bed and Breakfast offers three lavishly decorated bed rooms, a parlor and living room featuring a wood and gas fireplace, formal dining room, breakfast room, sun porch, and a relaxing full porch decorated with a swing and sitting table for your dining pleasure. 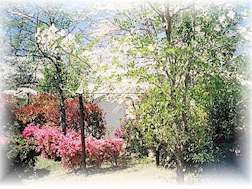 The Grounds are of sprawling camellias of many colors as well as other beautiful flowers and dogwood trees. Ambrias Garden Manor Bed and Breakfast is easily accessible from Interstate I-95, only a few miles. Its downtown locations provides various restaurants nearby. We are available for lunches, brunches, business meetings, small weddings, and special occasions. Contact us direct for information. A great stop over for those traveling from New York to Florida or for those looking for a great get-a-way. We're located between Charleston South Carolina and Myrtle Beach South Carolina on Interstate I-95. Yet, we equally close to the South Carolina state capital of Columbia, SC. 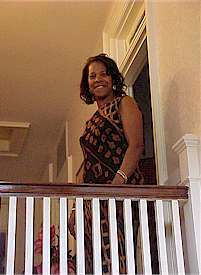 We look forward to having you as our guests here at Ambrias Garden Manor Bed and Breakfast. The location is great, half way between New York and Florida"